Alycia Sellie, the Graduate Center Library’s newest librarian. The Graduate Center Library welcomes Alycia Sellie, who has been appointed to the library faculty at the Instructor level. Alycia is the new Electronic Resources and Serials Management Librarian. She joins the Graduate Center after four years at Brooklyn College where she was the Media and Cultural Studies Librarian. Alycia is thoroughly engaged with issues of scholarly communication, electronic activism, and readers’ rights. She co-founded the Open Access @ CUNY blog and the Readers’ Bill of Rights for Digital Books project and she continues to explore issues of social justice and digital work in the humanities. 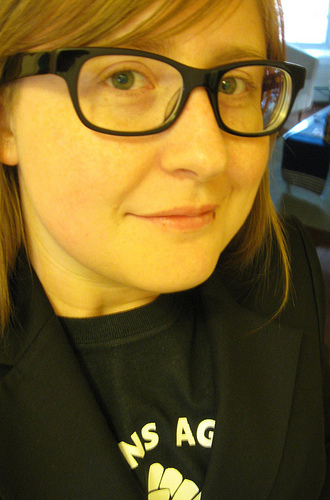 Alycia has specialized in unique library collections and zine librarianship. She debuted the Brooklyn College Library Zine Collection in 2012–a living archive of works made by and for Brooklyn College students. The collection now houses over 1500 zines. Alycia’s work on this collection grew out of her experiences organizing the 2009 NYC Zine Fest and founding the Madison Zine Fest in 2004, and from making her own publication, The Borough is My Library: A Metropolitan Library Workers’ Zine. Before joining CUNY, Alycia worked in Brooklyn at the Pratt Institute Library as the Public Services Coordinator; in Madison, Wisconsin at College Library and in the Memorial Library Preservation Lab; and as a substitute librarian at the Minneapolis Public Library. She had her start in librarianship working in the distinguished Newspapers and Periodicals department of the Wisconsin Historical Society Library with the alternative and radical press expert, James Danky. Alycia holds a B.S. in Fine Art and an M.A. in Library Science, both from the University of Wisconsin-Madison. She is currently a student in the Master of Arts in Liberal Studies program at the Graduate Center writing her thesis about the intersections of zines and copyright.